Exfoliation is the perfect detoxifying treatment for dry, lackluster skin. 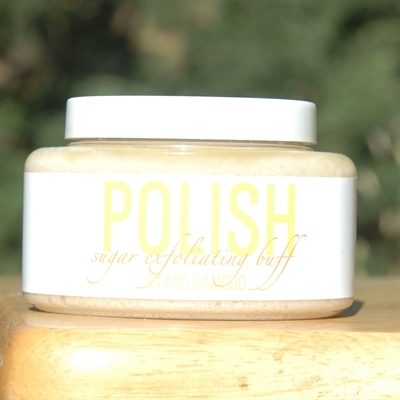 Scented and infused with 100% essential, organic oils that moisturize while brown sugar crystals improve circulation. Slough away dryness while eliminating blemishes and impurities to reveal firmer, brighter, more radiant skin. About Essence of Island Bamboo--refreshing and cleansing--reminiscent of fresh fields of grass, this scent enlivens the spirit and body at once while inspiring your bathing experience with the refreshing essence of green bamboo. A delicate fresh scent that lingers on the body for both men and women to enjoy.